"The Boogie Nights of serial killer flicks" said the promotion for this film when it first came, and rightly so. 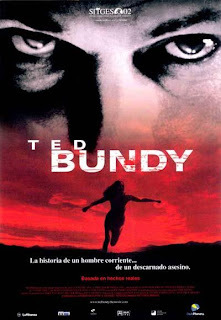 Mr. Bundy runs across the screen slashing women to bits during most of the movie, while groovy music makes your foot stomp the beat. This is a serial killer film that makes you feel good. It roughly follows the true life of one of history's most notorious serial killers, and even though his actions are horrific enough, the true scare factor comes from the fact that the film wants you to cheer for the monster. Bundy is not portrayed as someone who must be stopped. He is the misunderstood hero. While some even go to the lengths of calling it a black comedy, the weird thing is that Ted Bundy was considered a hero in real life too. After killing what is believed to be several hundred women and finally being caught and confined to death row, he received dozens of love letters from women all over America, and even had regular conjugal visits, from girls he'd never seen before.